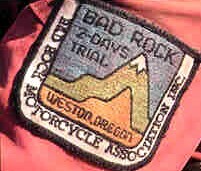 Original Bad Rock Rider's identification patch. 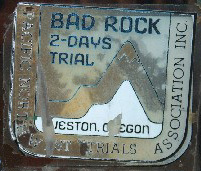 Promotional sticker from 1974 Bad Rock event. Still visible on one one of the buildings in downtown Weston until 2011. This is your chance to ride through some of the back country and the actual trails used during the famous Bad Rock ISDT qualifiers of the 1970's. This is where Hodaka motorcycles were designed, developed and put to the ultimate test. The event takes off from the historic town of Weston Oregon, approximately four miles east of Athena. It's about a 50 mile course, designed to be an easy ride for someone who has not been riding regularly or who wants to protect their investment in some of those hard to find Hodaka parts. The club will provide a trailer at several points along the route to transport bikes with mechanical problems or bikes from riders who, for whatever reason, just don't wish to finish the course. The course does include several sections where the route users county roads. Special arrangements have been made with the local authorities to allow trail bikes to use these sections during the event. Other than county roads, all the off road sections are on private property and will not require an ORV permit. However, all bike must be equipped with a working silencer and spark arrestor. BAD ROCK TRAIL RIDE 2017 SIGNUP AVAILABLE NOW. If you have questions about the event, please send an email to info@hodakadays.org. John Patterson, original organizer of modern the Bad Rock riders waiting to be unleashed the beautiful Blue Mountains on a sunny day in June.